We spent the first night of our road trip in Lexington, Kentucky. Normally when I plan our trips I verge on over planning. I research hotels and restaurants and make spreadsheets of the best locations and an itinerary of things to see each day. We can be flexible, but it's nice to have an outline so we don't miss anything we really want to see. But on this road trip we wanted to be a little more spontaneous. We hoped to make it all the way to Lexington on our first day, about a 7-hour drive and we'd read we could get a hotel easily enough without a reservation so we played it by ear. Unfortunately we don't follow horse racing. Little did we know, two of the biggest horse events of the year were happening in Kentucky the two days we would be travelling through. In Lexington, it was the Rolex, Kentucky and the city was almost booked to capacity. A week later we hadn't learned our lesson and had to skip Louisville because it was Kentucky Derby weekend. So we've learned to check the calendar for horse events when visiting Kentucky in the future. But we managed to find a room for the night, and Lexington was good to us. Everything came together almost magically without planning. We used the Rate Beer Places app to find a bar with craft beer that was open nearby. When we arrived we saw a taco truck in front of another bar across the street. So we went over and ordered some tacos. We were shocked and delighted when the taco guy asked whether which bar we wanted our tacos delivered to. He said he'd bring them to us across the street! It was a nice change from our home town where they've just voted not to allow food trucks on city streets at all. So we had our tacos and beer and then headed to another bar with a good beer selection, the Atomic Cafe. It had a Caribbean theme and really cute décor. Across the street was a very nice looking brunch place. I looked online at the menu and it looked perfect, then I saw on Yelp that it's considered the best brunch place in Lexington! We were so happy to have stumbled across this place for our first Southern meal. Like many of the places we visited on this trip, you line up and place your order then take a number to your seat where your food is delivered when it's ready. There was a long line, but it moved quickly. This was our first experience with grits and it was hit and miss. I had bacon, eggs, biscuit, cheesy grits and sweet tea. I found the grits a little bland but the biscuit was amazingly delicious. They gave us black raspberry bourbon jam to go on the biscuits. Although I'm not normally a jam-eater this was so incredible we polished it off. The table next to us was negotiating dozens of biscuits and jars of jam to take home. Matt ordered shrimp & grits with French press coffee and a biscuit. The grits came with shrimp, country ham, tomato gravy and green onion remoulade. All of it was delicious! 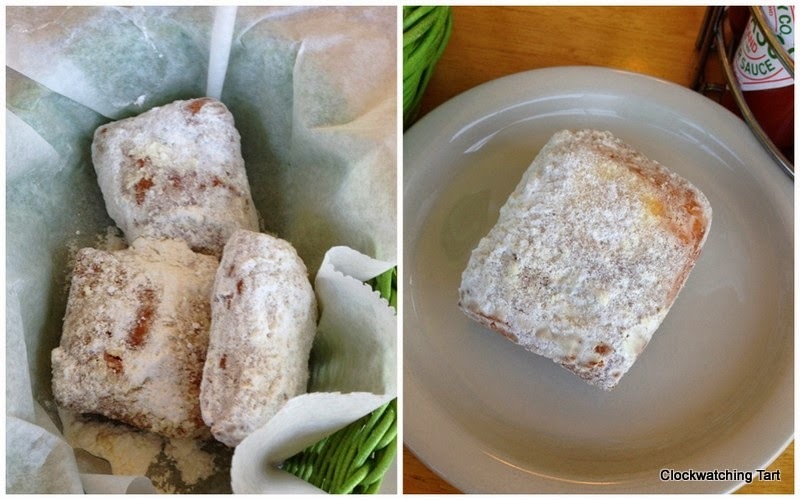 We also couldn't resist ordering fresh beignets. They were hot and sweet and so fantastic. It was way too much food but we're so glad we stumbled upon this place. Next we were able to tour a brewery and bourbon distillery right in downtown Lexington. The Lexington Brewing & Distilling Company offers a tour with samples of beer and bourbon. Matt tried all the beers and enjoyed the bourbon barrel aged stouts. I sampled all the bourbons. They were very tasty. I had hoped to visit more bourbon distilleries in Kentucky on the Bourbon Trail but unfortunately we didn't have time and had to move on so I'm glad we found this distillery right in the city. Our next lucky break was making a wrong turn and stumbling across Country Boy Brewing. Matt had sampled some of their beer at the bars the previous night, but the selection at the brewery bar was outstanding. They had beer from all over the USA and their own beer was great. Matt tried samples of four different stouts and loved them. I tried a nice German Gose. The bartender was so friendly and welcoming we had a great time. He also recommended we try West Sixth Brewing Company so we stopped by there for a drink too before heading on to our next destination. We were sad to leave Lexington when there was so much left to see. We definitely plan to visit again for more than just one day.